Kawaffle is on its way! Saturday 13 April sees Plymouth Market’s latest food offering open and if you’ve got a sweet tooth, make your way down to the Market for an amazing treat, full of gooey temptation and joy! What Kawaffle will you choose? The new Kawaffle stall will be serving up freshly made desserts with a number of fillings and toppings on offer, including blue bubble gum ice cream, tasty strawberries, melted chocolate and all-time favourites smarties, to name but a few. 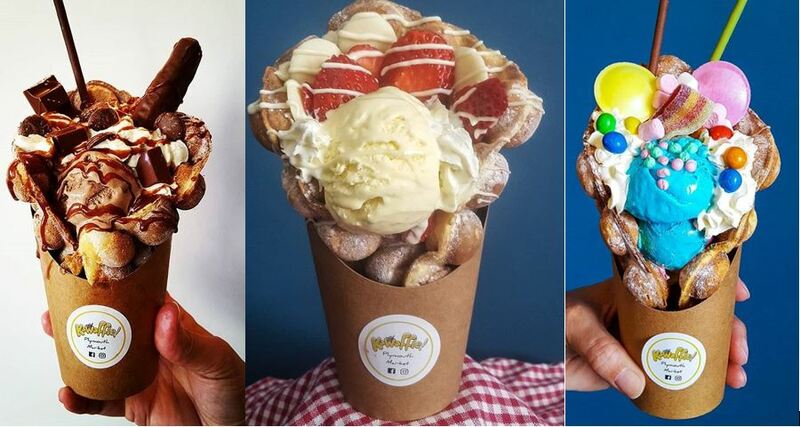 Sandwiched between a tasty sweet bubble waffle, you’ll be able to choose from Kawaffle’s menu of scrumptious house specials or try out some adventurous combinations of your own – the choice is yours! Banana, caramel, cream, Nutella, peanut butter, chocolate sauce, Oreos, Twirls as well as tasty toppers are among the fillings and mixes available at Plymouth Market’s Kawaffle. And the fun doesn’t stop there; you can also choose from lolly waffles, hot chocolate and milkshakes too. If you’re vegan and eat gluten-free, Kawaffle will be able to cater for you too. As well as fresh produce stalls to make your own delicious meals, Plymouth Market is home to a wide range of culinary delights, savoury and sweet, from traditional English fayre through to pizza, sliders and Asian-influenced cuisine, as well as a patisserie serving up cakes, biscuits and tartes, handcrafted and baked on the premises. Joining the Saturday benches in the Market on Saturday 20 April will be hand-made macaroons and Maltese Figolli from Plymouth-based Pumpkin Joe Bakes, who already has quite a local following. A great family treat for Easter, make sure you pop in and get your Easter Sunday treats sorted. Don’t forget all the other wonderful stalls and the huge range of goods sold throughout the Market, it’s a great place to browse and shop, whatever your looking for. We sell everything from clothing to net curtains, books to DVDs, pet supplies to furniture, jewellery to inkjets and everything inbetween.